Love to Learn: Sign up today for our cross-curricular Key Stage 2 projects! 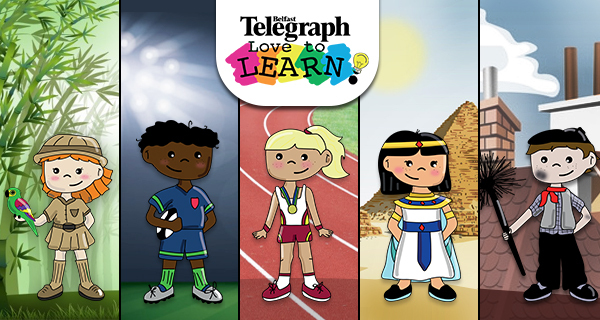 Register your KS2 classes today for Belfast Telegraph “Love To Learn” projects! Welcome to the registration page for Belfast Telegraph “Love To Learn” projects. Designed for Key Stage 2 classes by our panel of local teachers, these projects present a range of active learning experiences that make the Northern Ireland curriculum come alive. Each pupil registered will receive a 16-page booklet of activities, a poster and stickers. All projects include a weekly copy of the Belfast Telegraph at a total cost of £2 per pupil*. We also have a special offer rate of £5 per pupil* for schools who register for three projects. All registrations for the Ancient Egyptians must be received by Friday 10th May 2019. Through this interesting and exciting topic, the civilisation of Ancient Egypt will be brought to life. Pupils will learn how these people, who lived 5000 years ago, have contributed to the development of modern society. They will explore the daily lives of the Ancient Egyptians - their houses, food and clothes. They will learn all about their pyramids and tombs, their pharaohs and mummies. They will enjoy lots of fun activities such as quizzes and crafts, learn how to write using hieroglyphics and of course, gain insight into the mummification process focusing in particular on our local mummy, Takabuti who can be found at the Ulster Museum. The Rugby World Cup kicks off in Japan in September 2019 and our autumn project will give pupils the opportunity to explore themes connected to this exciting global event! Learn about the countries involved in the tournament through our fascinating fact files, before using world maps to complete activities on scale and distance. Explore the history of the Rugby World Cup and find out how hosting a major sporting event benefits a country. Carry out research into famous rugby players, collecting and analysing data to produce charts on their performance. Investigate how rugby players train and fuel their bodies to perform on the pitch. With opportunities to write reports, complete comprehension tasks and carry out research, our Rugby World Cup project will give your class plenty of engaging activities to tackle! The Rainforest topic encourages children to develop a sense of place; where rainforests are located through map and Atlas work, the effects of natural and human events upon a place and how we may change the environment both locally and globally. Through a range of literacy activities children will read about the rainforest, complete cloze/comprehension activities, sort and organise information and create a fact-file based on findings. Numeracy tasks will develop children’s data handling skills and give opportunities for reading tables/charts on rainfall. There are a number of fun, artistic and investigative tasks associated with this topic including studying and recreating the art of Henri Rousseau, ideas to create the layers of the rainforest and how to make a rainforest in the classroom! In the summer of 2020, all eyes will turn to Tokyo, Japan for the summer Olympics. As this event only comes around once every four years, it will be a very exciting time and there will be many learning opportunities for children. Through this topic, they will increase their knowledge of the World Around Us as they learn about the culture of the host city, Tokyo and gain knowledge on how this city was chosen. They will increase their thinking skills and capabilities through self management, creativity, decision making and working with others to explore the history of the Olympics with their ancient games and mythology and comparing these to the sports that will be included in 2020. They will manage information through discovering which nations are involved and by exploring case studies on the athletes themselves. This project covers a fascinating period of history. The activities will cover the breadth of the Curriculum and will include a Literacy, Numeracy, Arts, and World Around Us focus. Pupils will have opportunities to learn more about Victorian workhouses, hospitals and jobs. They will learn to empathise and compare their own lives to those of Victorian children and will also learn about famous Victorians including, Florence Nightingale, Charles Dickens and Lord Shaftesbury. This project will help to develop the skills of curiosity, exploration and questioning and gives pupils the chance to gather information, make connections, problem solve and taking risks in their learning. - The initiative is open to all Key Stage 2 pupils and those in special schools in Northern Ireland. - A minimum number of 10 pupils must be registered per project. - Materials are copyrighted and may not be reproduced. Each pupil requires their own project pack and newspaper to complete the project. - A maximum of 600 classes may register. - All participants agree to the use of their name/photographs for publicity purposes. Prior permission will be sought.